One great thing about the keto way of eating is that you can have good quality bacon and enjoy it every single day if you wish. Eggs are also a staple in the keto diet. Besides that, bacon and eggs are versatile and easy to cook with, so we tend to include them in breakfast, almost daily. But what happens when you get a little tired of yet another bacon and egg breakfast? Or how about if you don’t normally enjoy consuming these two commonly used ingredients in your keto diet? Of course, you can have keto butter coffee for breakfast (which is delicious). Or you can try keto versions of old favorites instead. So that brings us to this collection of the best non-bacon-and-egg ketogenic diet breakfast ideas on the Internet. 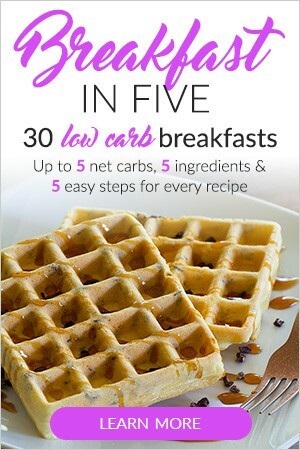 Everything from keto breakfast casserole to low carb breakfast bars and keto-friendly cereal. It’s all right here, friends! These keto diet breakfast recipes are simple, delicious, and some of them have no eggs at all (in case you’re after completely egg-free recipes). Also, be sure to check out our review of the 3 Fat Burning Keto Meal Plans that are worth trying! You can have almost any old favorite while on the ketogenic diet – and this time it’s actually good for you. Like this Perfect Keto Frappuccino. It combines all the good keto-boosters (is that a word?) such as collagen peptides, MCT powder, and chocolate sea salt ketones. The frappuccino makes a nice change from a hot keto butter coffee. Get the recipe here. Chia pudding is so simple to make and there are a variety of ways you can serve it. So many flavors and variations can be easily created. In this recipe, you will enjoy a delightful combination of strawberries, yogurt, cinnamon, and ginger. Feel free to substitute the full-fat yogurt with coconut milk yogurt for a dairy-free alternative. If you are a huge fan of chia pudding, check out the best chia pudding recipes here (just be mindful that only some of these chia recipes are keto, and the rest, you can draw inspiration from). Fat bombs are not just good for snacks. These Keto Mocha Fat Bombs are perfect for a quick make-ahead breakfast. Click here for the Keto Mocha Fat Bombs recipe. Want more fat bomb ideas? Check out these 44 Keto Fat Bomb Recipes. Sometimes, you just need a little bit of sweet combined with a little bit of lemon. Baked goods are not a thing of the past in the keto diet, and this recipe proves it (pun not intended). These lemon blueberry muffins will easily fit into your macros since they are also high fat and moderate protein. And to top it off, it’s delicious and very low carb with only 3g net carbs. But please, do you use pure lemon extract for this recipe. Of course, if you don’t like lemon, you can always use vanilla extract. Here is the recipe. Here is a truly egg-free breakfast recipe, made using flax meal and shredded mozzarella cheese. It takes about 30 minutes (prep and cooking time included) to make these hot pockets, but it will be time well spent when you take that first bite. You can even make them ahead and leave in the fridge for up to 3 days. Get the recipe here. This keto super smoothie is nutty, creamy and chocolatey. It has all the ingredients that make a smoothie filling and perfect for breakfast. It uses the three keto superfoods: nut butter, avocado and chia seeds. Click here to get the recipe from Perfect Keto. We couldn’t resist adding another smoothie to the list. This recipe is one of our all-time favorites. Get the Acai Almond Butter Smoothie recipe here. Want more smoothie ideas? Check out our list of favorite Keto Smoothies next. What’s for dinner? That question might be on your mind more often than not when you’re on a keto diet. If so, I highly recommend The Keto Beginning 30-Day Meal Plan. You will not only learn about the best way to make the transition to ketosis, but you will also get fabulous recipes for 30 days! Click here to buy it and start your fat burning journey now. Now, I have tried various low carb keto-friendly pancakes. Most recipes call for coconut flour or almond flour to keep pancakes low carb. However, I found this coconut flour based recipe to be much tastier than some of the almond flour ones. It holds together a bit better than almond too, so you can keep leftovers in the fridge and warm up when needed. Okay, so this breakfast casserole recipe does use pork sausage but it’s not a typical bacon and egg breakfast. The peppers and spice make this a far more interesting keto breakfast to try. It can also be made gluten-free if you use gluten-free sausage as per Kalyn’s advice. So what are you waiting for? Get the recipe here. Did you ever think you had to say goodbye to cereal for breakfast? Not if you make yourself these grain-free cinnamon toast crunch cereal. These are made with almond flour, grass-fed butter, sweetener and of course, cinnamon. Get the details on how to make this tasty bowl of keto cereal recipe here. Cookies for breakfast? Any day. Another reason to make these today is because they can be stored in the freezer for a quick sweet treat or snack. And chances are, you have all five staple ingredients in your kitchen right now. This is a great idea for “no egg no bacon” meal whether you have it for breakfast, lunch or dinner. Plus, whenever you do want to eat eggs again, you can add them to this delicious bowl of chili. Almost any topping works for this dish. Just be sure to account for the carb counts if you add extra toppings. The best kind of granola is one made with peanut butter, crunchy almonds and other yummy additions. This is a must-try if you love your cereal. Find out how to make it here. These gluten-free keto biscuits are one of the best breakfast ideas and a great replacement for scones. If you haven’t made such flakey biscuits before, not to worry. They’re not as hard to make as you might think. In fact, the instructions for this recipe are very clear with lots of little tips and tricks. And with pictures included. This recipe uses a combination of fine almond flour, coconut flour, and flax meal which makes it the perfect treat for breakfast or as a snack. You will also want to use xanthan gum for best results. Love chocolate pancakes? Look no further. These keto-friendly chocolate pancakes are heavenly! Click here for the chocolate pancake recipe. If you have been keto dieting and haven’t made fat head dough yet, this is your chance. It’s made using mozzarella and it’s easy to make. The cinnamon sugar coating is made with monk fruit but you can use any other keto-approved granulated sweetener of your choice. The best part is that it’s very low carb with only 2.6g net carbs per 5 pretzels. Oh, and it’s yummy. Want more keto diet ideas and recipes? Thanks for the shout-out for my Low-Carb No Egg Breakfast Bake with Sausage and Peppers! Looks like a lot of other good ideas here too.